Are you ready to take your ACT practice to the next level? 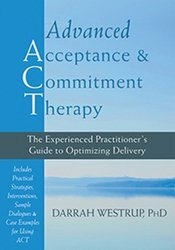 If so, Advanced Acceptance and Commitment Therapy is a powerful resource that can help you streamline your approach and overcome common hurdles that present in therapy. At some point or another, you have probably encountered difficulty putting theory into practice when it comes to using ACT in sessions with clients. You aren't alone. Although ACT is a powerful treatment option for a number of psychological issues, such as anxiety, depression, trauma, eating disorders, and more, it is a complex, ever-evolving model, and as such it can often be difficult to deliver effectively. The truth is that even the most seasoned ACT therapist will face challenges in their client sessions from time to time. This is the only advanced professional ACT book on the market, and it is designed to help you close the gap between what you've learned in ACT training and your actual client sessions. Inside, licensed psychologist Darrah Westrup, PhD, provides valuable tips and real-life client scenarios to help you hone your understanding of the core processes behind ACT. You'll also learn practical strategies for moving past common barriers that can present during therapy, such as over-identifying with clients or difficulty putting theory into practice. Most importantly, you'll learn when to deliver specific ACT components, and how to adapt your treatment for each client. This user-friendly, pragmatic, and thoughtful guide does not promote “error-free” ACT, but rather, ways to identify and work with the therapy process as it unfolds. A must-read for any therapist or mental health professional interested in sharpening their ACT skills. Darrah Westrup, PhD, is a licensed clinical psychologist practicing in Colorado and California with an established reputation for her work as a therapist, program director, trainer, researcher, and consultant to practitioners at various firms and organizations. She is a recognized authority on post-traumatic stress disorder (PTSD) and acceptance and commitment therapy (ACT) and has conducted numerous presentations and trainings at international, national, and local conferences, seminars, and workshops. She currently serves as an expert ACT consultant for the VA-wide evidence-based treatment rollout of ACT for depression, and has coauthored two books on ACT: Acceptance and Commitment Therapy for the Treatment of Post-Traumatic Stress Disorder and Trauma-Related Problems and The Mindful Couple.